Washington, DC – On Wednesday, members of the House of Representatives and the Senate appointed to serve on the bipartisan Farm Bill Conference Committee held a public meeting as work begins to produce a final Farm Bill that can pass both chambers. 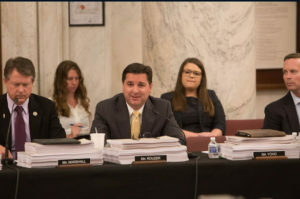 During the meeting, members delivered opening remarks highlighting the shared goal of strengthening the farm safety net during a time when net farm income is down by 52 percent from where it stood five years ago and farm bankruptcies are up 39 percent over the past two years. The agriculture industry contributes $87 billion to North Carolina’s economy, accounting for more than 17 percent of the state’s economy, and employing 17 percent of the state’s workforce. As the Chairman of the House Agriculture Subcommittee on Livestock and Foreign Agriculture, Congressman Rouzer led efforts to authorize and fund $450 million to enhance the USDA’s ability to identify, diagnose and respond to potential animal disease outbreak, including $150 million in year one to establish a new U.S.-only vaccine bank with priority for stockpiling Foot and Mouth Disease (FMD) vaccine.